Todd Gann and Hevvy Metal moved from fifth place in the World standings in the $25,000 Novice to the Reserve World Champion position by earning $4,287 and the Show Championship to start the day’s action in the Watt Arena at the Mercuria National Cutting Horse Association (NCHA) World Finals on Dec. 1. Gann and “Scrap Iron” marked a 221 in the first round and won the second go with a 223, for an average-winning 444. They ended the year with $26,427 in earnings. 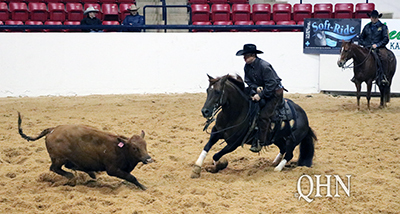 Owned by Thomas Guinn, of Philadelphia, Mississippi, Hevvy Metal is a 6-year-old Metallic Cat gelding out of the Dual Pep mare Dual Nurse, who was the 2003 NCHA Non-Pro World Finals Show Champion.